Conscientious Employee Protection Act "Whistleblower Act"
The Conscientious Employee Protection Act "Whistleblower Act" is a whistleblower law poster by the New Jersey Department Of Labor and Workforce Development. This is a mandatory posting for all employers in New Jersey, and businesses who fail to comply may be subject to fines or sanctions. This poster, written in both English and Spanish, must be posted in a conspicuous place where all employees will see it. This poster describes how the law protects employees who notify the government of the illegal activities of their employers. NJ All-In-One Labor Poster: Instead of printing out dozens of posters, employers can also purchase an all-in-one poster that covers both New Jersey and Federal poster requirements by clicking here . It appears you don't have a PDF plugin for this browser. Please see the link below to download new-jersey-cepa2701.pdf. or protection of the environment. N.J.S.A. 34:19-3.
that the situation is emergency in nature. This notice must be conspicuously displayed. retirados o pensionados del empleador o de cualquier agencia gubernamental. por escrito y le haya dado al empleador una oportunidad razonable para corregir tal actividad, política o norma. físicos a su persona siempre y cuando la naturaleza de la situación sea la de una situación de emergencia. Este aviso se debe exponer a la vista de todos. Anualmente, patronos con 10 o más empleados, deberán distribuir notificación de esta ley a todos sus empleados. Si necesita este documento en algún otro idioma que no sea inglés o español, sírvase llamar al (609) 292-7832. There are an additional ten optional and mandatory New Jersey labor law posters that may be relevant to your business. Be sure to also print all relevant state labor law posters, as well as all mandatory federal labor law posters. Instead of printing out pages of mandatory New Jersey and Federal labor law posters, you can purchase a professional, laminated all-in-one labor law poster that guarantees compliance with all New Jersey and federal posting requirements. Fully updated for 2019! While we do our best to keep our list of New Jersey labor law posters up to date and complete, we cannot be held liable for errors or omissions. Is the poster on this page out-of-date or not working? Please let us know and we will fix it ASAP. 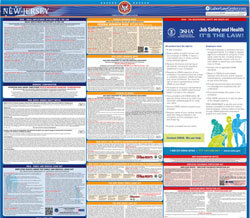 LaborPosters.org will email you a printable PDF of this New Jersey labor law poster, 100% FREE. You'll also get notified when new posters are available. Your New Jersey poster has been downloaded and emailed! This poster download is provided as-is, with no warranty or guarantees. Please verify with Federal and New Jersey authorities to confirm that you are posting all of the correct (and updated) posters required for your type of business. Instead of printing out pages of mandatory New Jersey and Federal labor law posters, you can purchase a professional, laminated all-in-one labor poster.